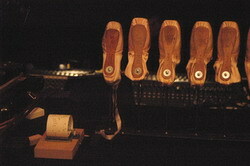 In the chance procedures Cunningham uses at some point in the making of each of his dances, all the available elements are his. This movement first, or that one? The moves are all his. What number of dancers? The number available is up to him. Chance is simply a marvelous surprise-generator. And Cunningham likes surprises. There are two scores, commisioned from the British Radiohead, playing live opening night, and the Icelandic Sigur Rós, who sweetly fall in love with the dancers and, as it turns out, will stay on in the pit for the whole run. Each band has composed a piece of twenty minutes and Cunningham has made two dances of twenty minutes (known as A and B ). There are two backdrops, both by photographers. One is by the 18-year old Robert C. Heishman, who works in black and white ( often using cameras made from everyday objects, with film in one end and a pin hole at the other.) 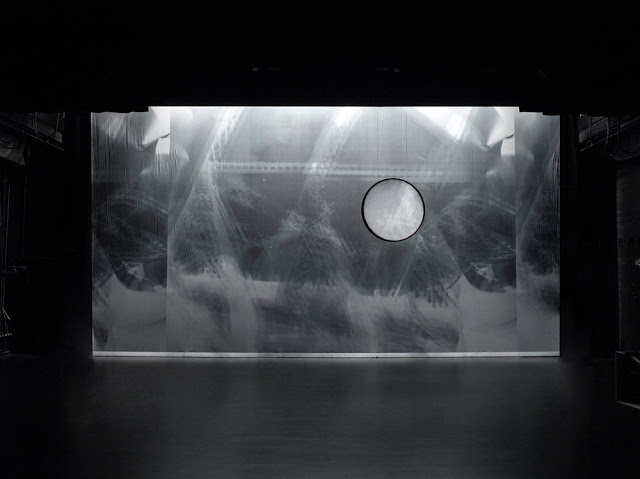 The other is by Catherine Yass, working in color (using a large-format camera, and layering and lighting techniques to produce composite images with manipulated and heightened coloration). 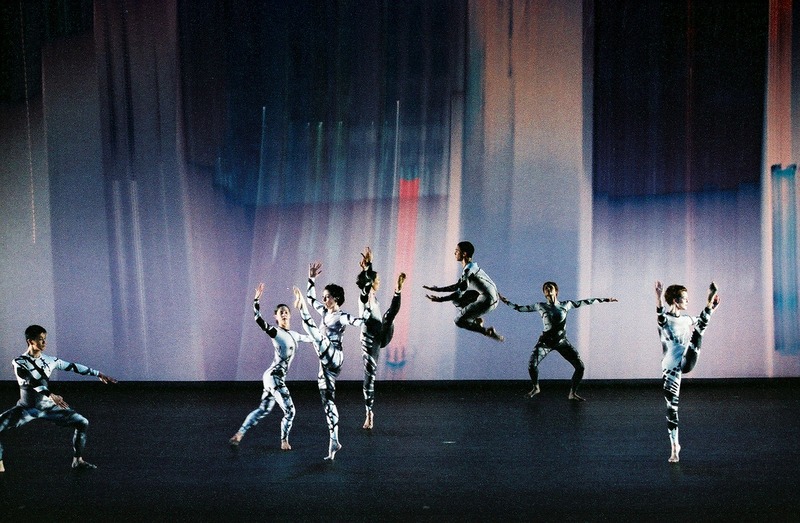 There are two sets of costumes by James Hall, one black and white unitards, the other silky-looking bell-bottomed jumpsuits, all sleeveless, with acid-trip coloration. Each set of clothes is similarly imprinted with a network of black crisscrosses and branches suggesting twigs, or spider webs. There are two light plots. So that we can see the whole thing, James. F. Ingalls has been called upon to devise interchangeable light plots, which, as a convenience, are given numeric names. One is from the 200 Series; the other from the 300 Series. ON OPENING NIGHT, the curtain went up on Michael Bloomberg, the Mayor of New York City, who introduced Merce Cunningham and two of his former artistic directors, Robert Rauschenberg and Jasper Johns, there to roll the die. Three titans of twentieth century modernism , gamely chancing it in the twenty-first. Cunningham walked with a cane now, and not easily, with the Merlinishness he has long exhibited is in full flower. He really did seem to travel backwards through time, meeting up with the young and showing them the way to the future. Rauschenberg had suffered a stroke, but his merriness seemed intact. He was, as ever, a really loveable public personage. Johns, in contrast, exhibited a truly magisterial aloofness, not the usual aspect of someone who is about to roll snake eyes (or not). These personal characteristics were not so very different from the characters of their art: magical, warm, cool. To see them together was, well, something. Joining them on stage were the company’s patroness saint, Sage Cowles; Cunningham’s beautifun longtime dance partner Carolyn Brown; the bands; and the designers; and the dancers, who popped up now and then as they jumped to maintain a warmed-up state. After Cunningham explained the chance process, to no small confusion and amusement on the part of the audience, a die was produced for an on-the-spot determination of which of each two-part production component would go first. (David Vaughan, the Cunningham archivist and chronicler, serves as the master of ceremonies during these procedures.) So, the titans of modernism tossed the die. “A gimmick,” a man behind me would mutter later in the week, on the last night. (And it does take a lot of explaining, before one can even begin to get at the dancing itself.) But as it turned out, not a gimmick, but a revelation. For while the elements stayed the same from performance to performance , they would vary in their combination, though very slightly, as chance had it. One could make an aesthetic judgement about the various results; one might have a preference. From evening to evening, one went home floating on air, or shuddering. The audience response was vivid each night—the houses were sold out, right up to the rafters—but the group preference was clearly for color, for pleasure, and for a happy ending. So it was on the first night, which went from dark to light. Black and white costumed dancers in front of a black and white backdrop depicting what was perhaps a ruined roller coaster, glimpsed through fog. The lighting throughout enhancing directionality—if the dancers looked up, light took their upturned faces. From the sides, light enhanced curves, sharpened angles. Unobtrusive shifts in lighting levels, giving a sense of time passing, and of narrative—light suggesting, as it does, time of day, and time passing, or place changing, without overtly imposing meaning. Radiohead offered a sonorous and serious score, varied in texture, and with no overwhelming beat. It was not so very different in kind from other electronic music the company has commissioned in the past, and one felt the rockers were making a bid to follow in the serious footsteps of the electronic composers who have preceded them on the company roster. At any rate, they gave themselves over to the cause at hand, and served the Cunningham well. The effect was of starting off in Kansas, and ending up in Oz. The costumes were happy and bright and sugary, the photographic backdrop smeared buildings into towering pastel after dinner mints, and Sigur Rós employed a xylophone; a battery of timpani constructed of toe shoes; the recorded sounds of a baby cooing; and some wind-up devices they happily used to tick-tock along with what they could see from the pit. This part of the work also contains two passages of enormous warmth—a solo first danced by the beautiful Jonah Bokaer, and a quadruple duet—that is, the same duet multiplied by four, that reads like a sermon on love, with each couple doing the same thing, but in its own touching and individual way. The choregraphy here incorporate a ravishing figure in which the woman climbs onto her partners’ back as he lunges to one side, is carried over onto his front as he shifts to a lunge on other side, and knifes her legs over to end up behind him again. This is a beautiful and rapt a phrase as Cunningham has made. Despite these lush interludes, and also a comedic trio reminiscent of the Cunningham videodance “Delicomedia,” much of “Split Sides” is fiendishly difficult, and notably spare. It can readily be characterized as Late Cunningham, with the choreographer frequently working in multiple images of the same figure—for instance, eight dancers each doing the same thing, but each with a different front, so we see the step from different sides at the same time. 360 degrees, all from your seat. CUNNINGHAM always stands at a kind of choreographic South Pole where every direction is North; or alternatively a North Pole, where every direction is South. For him, every direction is front. Here he fractures the figure into multiples, in angular, sparse poses that refract each other, so that the stage is a prism. This part of his work is unforgiving, and from a distance, chilly. Up close, as from the second row, the personalities of the dancers enliven it. Where you sit makes the dance different as much as any chance changes rung before the curtain—but that is always true at a dance performance. You can sit back, and see the night sky, or sit close, and see the human condition. Rather surprisingly, the flipping of costumes makes a new dance—or perhaps the same dance with a different mood. In fact, Split Sides looks very moody indeed this way, resembling some sort of cruel psych experiment. In sum: the dance was easier on the eye last night, and it has given up its unity of impression. This isn’t to say there is a better version or a worse. But there is a pleasant and a much less pleasant. The disharmony tonight only points up the exigencies of this particular format, with the parts transposible. By neccessity, “Split Sides” feels on first enounter like a Cunningham “Event,” one of those signature amalgams of parts of various dances, rather than one of the great repertory works possessed of an ineluctible inevitablity. Because the halves can run in either order, they have to have beginnings and ends that won’t put a dancer in two places at once, or in one place wearing one costume one second, and another the next. Thus the troupe is divided in half at signal junctures. But company and continuity are not the only things split. The body itself is split every which way—one half against another, side to side, top to bottom—and dancers themselves are split, even when dancing together. As evidence there exists the most difficult, cool, clinical duet ever devised by Cunningham, first danced by two virtuosi of the impossible, the firebrand Holly Farmer and the soulful Daniel Squire. In this encounter, neither seemed to have anything to do with the other; they intersect with hostile inadvertence. In the end, in anything but abandonment—she gives the feeling she could just reverse course with no need of a partner—Farmer fell back into Squire’s arms in just the way that Cathy Kerr fell back into Alan Good’s arms in the Cunningham masterpiece “Points in Space.” So similar, so different. All chance, direction which thou canst not see…. This is the same as the first night but with the lights switched, by far the most subtle change one can ring here. Light, which enables us to see, is hard itself to hold in the mind. A throw of the dice will never eliminate chance. BY NOW there is consternation in the front of the house, and a certain disbelief backstage. Night after night, and still the same order of music, dance, set! (If anyone thought the results were rigged, this certainly proved contrary—one somehow expected, and even hoped for a dog’s dinner night to night, with everything all mixed up.) The pre-show cast inverted the dance order, so hopes were high at the public tosses—but the die came up odd all the way. Same old, same old, one should think. But no. The consequent change to the work is astonishing. Brought forth by a few rolls of a single die, tragedy comes calling. The first part, all warmth and sweetness, with young Jonah in his solo and the four couples in their love song, yields to the harsh wintry second part, with the dancers looking like extremely intelligent aliens who have just this moment come to inhabit human bodies, trying them out for the first time without knowing any of the human rules of moving. The eye glances off what it does not recognize—the glinting surface of the unfamiliar, as glances, too, the mind. Bleak, bleak, bleak—the summer of the first half giving way to winter, sunlit youth yielding to starlit age, remote and chill. At the curtain calls that night, radiant Jeannie Steele—whose love for the dancing so suited her to be the choreographer’s guardian angel—stepped off to get Cunningham. He entered on her arm and joined his troupe, taking his place at the far left of the stage. The company stepped back to allow him a solo bow, then turned as one to applaud him, so courteous, so gallant, so persevering, standing there in a brilliant orange shirt. Shortly thereafter, the curtain came down on the Merce Cunningham Dance Company’s New York season. The company flew off to other theaters, other performances, Cunningham still then traveling along to run the show . 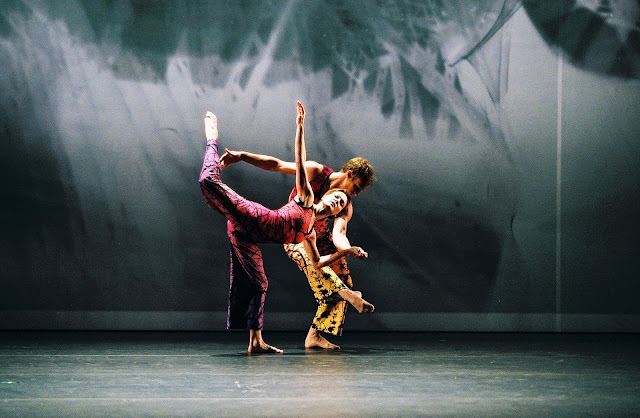 WHATEVER CHANCE procedures he used in making the repertory were been made during during the choreographic process, the results striking sparks to his own creativity. He did not take any chances on his dancers, whom he selected and cast. And for all the freedom he allowed his composers and his visual artists, their work was made before the curtain rises (though the music often contained variables). But there was indeed a rogue element at play at the time of the performance—an element that is random, uncontrollable, unknowable ahead of the event. That element would be us, coming into the theater with our minds cluttered and our sensibilities settled, carting around the baggage of the day. 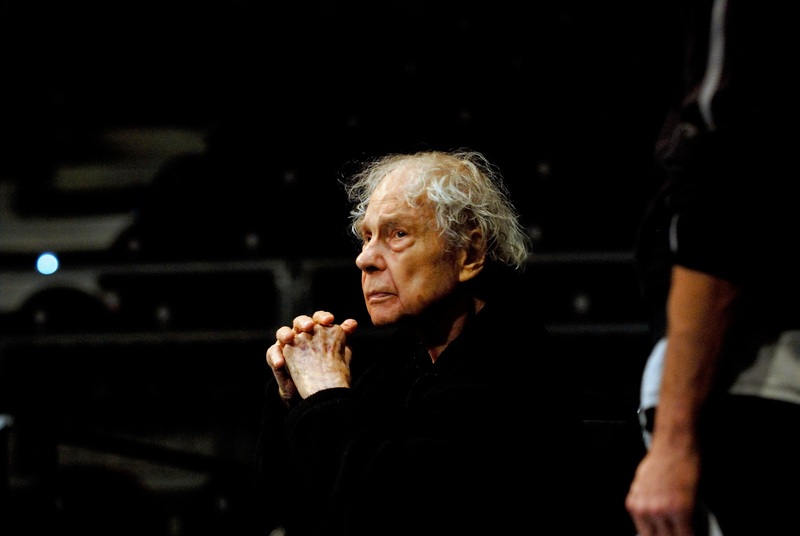 NIGHT AFTER NIGHT, year after year, in city after city, Merce Cunningham took a chance on us.